Alphen aan den Rijn, the Netherlands, January 17, 2018–Troi today announced the immediate availability of Troi Serial Plug-in 5.0.1 for FileMaker Pro 16. What is new in version 5.0.1? Fixed a problem with Serial_SetDispatchScript: you can now use a different wait string for each port. Added switch to Serial_Debug function “-UseTextAllBytes0To255”: you can use this in combination with the switch “-TestTriggerScript”. The plug-in will trigger a script with as test data all the bytes from 0 to 255. Improved the Debug.fmp12 example file, it now shows how to use the “-UseTextAllBytes0To255” and “-ConvertBytesToNumbers” switches. Also improved the Terminal.fmp12 example file, it now shows how to use the “-ConvertBytesToNumbers” switch when receiving data. (macOS) Fixed a compilation problem with code signing and extended attributes in macOS 10.12 (Sierra). The plug-in now indicates if an external script step is compatible with a product. 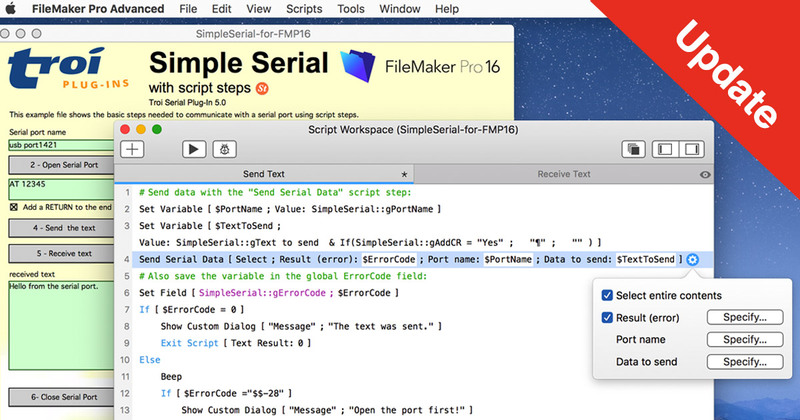 The step is shown in grey if it is incompatible for that product (for example iOS) in the script editing pane (center) and the script steps pane (right). Improved the log text when running FileMaker Server: more information is added to the log. After an unsuccessful attempt to register, the log now also adds the (incorrect) register text used. A fully functional demo version of Troi Serial Plug-in 5.0.1 is available on the Serial Plug-in page. Version 5.0.1 works with the 5.0 version of the registration. If you bought a license for a pre-5.0 version on or after June 2, 2016 the upgrade is FREE! Eligible users have been sent a new registration string in May 2017. Upgrades from a cross platform developer license bought before June 2, 2016 are available from US$ 499. You can order upgrades from our shop.